Annaghavackey is a townland of 369 acres in the Parish of Creggan, Co. Louth. In the 1854 Griffiths valuation, it seems that most of the townland is owned and leased to people who are related (DICKIE, BAILIE, BRADFORD, OLIVER). The total value was £283 1 0 in 1854. It is bordered on the east by Cavananore and Carrickastuck, on the south by Clonaleenaghan, to the west by Shanmullagh and on the north by Sheelagh and Tawnamore. Annaghavackey was also known as ROCHDALE and ROACHDALE NOTE: There are many spellings that crop up for these two places. Roachdale was part of Annaghavackey. Context of the townland of Annaghvackey showing surrounding townlands. Detail from 1822 November survey of part of the lands of Annaghavackey held by Andrew & Thomas BRADFORD. 1802 December Map of part of Annaghavackey belonging to Samuel and Andrew BRADFORD. Detail of 1802 December Map of part of Annaghavackey belonging to Samuel and Andrew BRADFORD. Updated January 24, 2011 - additions from Creggan Parish Register. 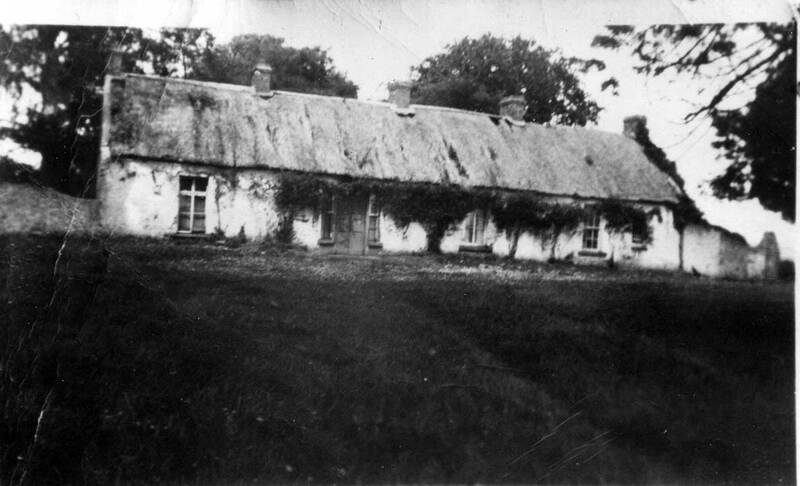 Bailie's House at Annaghavackey was occupied by William BAILIE (1884-1951), son of Henry Victor BAILIE, up until about 1946. In the memorial of the death of Catherine, William's wife, the house was referred to as Annavackey House. It was demolished in the mid to late 1950s. Their land was described as directly north of Rochdale. Photo thanks to the generosity of Eugene Lynch of Cavananore for the photo and the family history of Anne Finn which contained the details. 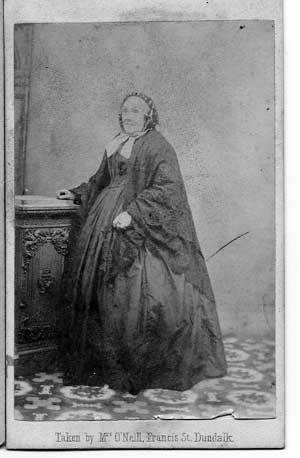 Mrs. Robert DICKIE of Roachdale aka Mary Anne WALLACE (1795-1870). No. *REFERENCE* A. R. P.
1825 Jun 12 Baptism of William McCULLAGH, son of John & Sarah McCULLAGH of Annavackey - recorded in Creggan Parish Register. 1830 Jul 12 Burial of John COULTER (1803-1830) of Anavacky - recorded in Creggan Parish Register. Will and codicils of Robert Ellis BAILIE of Shortstone concerning lands in Annaghavackey. Half of his lands at Annaghavackey were willed to his son, Rev, John BAILIE. Lands not devised to Rev John BAILIE were to go to his son, William BAILIE in some sort of trust. William’s keeping of hounds and “state of concubinage” with Mary Anne McLAREN. Four years after the death of his father, William BAILIE married and had six known (lawful) children: Margaret; Robert Ellis; William Frederick; Jane: Henry Victor and Charles Edward. 1835 Apr 26 Birth of Eliza COULTER, daughter of James & Margaret COULTER of Annavackey - recorded in Creggan Parish Register. PRONI Will Abstracts: The Will of William Bailie late of Annaghavackey County Louth Gentleman deceased who died 29 October 1879 at same place was proved at Armagh by the oaths of Henry Victor Bailie Charles Edward Bailie and Alfred Bailie all of Annaghavackey Farmers the Executors. Effects under £50. PRONI will abstracts: Letters of Administration (with the Will annexed) of the personal estate of Henry Victor Bailie late of Annaghavackey County Louth Farmer who died 6 November 1893 at same place were granted at Armagh to Mary Jane Bailie of Annaghavackey Widow a Legatee. Effects £62 2s. 6d. Death of Alfred DICKIE of Roachdale, son of Robert DICKIE and Mary Anne WALLACE and husband of Anna Maria McCULLAGH. 1901 The census shows the widow Mary Anne BAILIE living there with her three unmarried children, her brother James BAILIEand a boarder Robert BAILIE.